The Highlights: Sweeping Hudson River views; ancient forest roads; a picturesque village with nightlife. Other Places Nearby: A Revolutionary War village; the boyhood home of painter Edward Hopper; Nyack, a good town for antiques. Meetings & Event Options: There are many options at hotels in Tarrytown and other Westchester towns. To escape New York City, you don’t need a car or mass transit. You can walk out of the city across the George Washington Bridge onto a 240-mile footpath that plunges immediately into the forest and leads all the way to the northern Catskills. 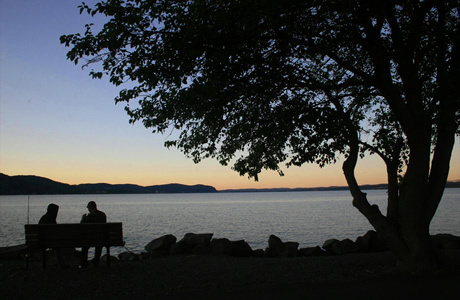 On this walking tour, you follow a short stretch of the footpath through Piermont, a charming, small New York town on the western bank of the Hudson River that seems more suited for Vermont than the New York City suburbs. That the nation’s largest, most congested city should have a direct footpath to wilderness is no fluke. It reflects the vision of the region’s avid walkers who formed into dozens of local clubs as early as the late 19th Century and, perhaps, even earlier. In the early 1900s, walking had become so popular that the New York Post published a regular column on the subject, “The Long Brown Path,” penned by Raymond Torrey. Torrey, revered by local walkers as an early pioneer, also helped write the New York Walk Book, the region’s first comprehensive walking guide, published in 1923 and currently in its seventh edition. In 1920, Mayor Welch, chief engineer of the Palisades Interstate Park Commission, established a trail conference to construct and maintain trails in the newly acquired Harriman Park northwest of New York City. Enlisting the help of local walking clubs, the group, which became known as the New York-New Jersey Trail Conference, worked for seven years constructing numerous blazed trails in the fledgling park. Considering its work accomplished, the group disbanded in 1927, but trail-building by local clubs continued. The popularity of walking gave rise to an anarchic development of trails throughout the region, some blazed one way, some blazed other ways, many not blazed at all. The trail-building frenzy alarmed Torrey. He brought together the heads of the region’s walking groups in the 1930s to revive the New York-New Jersey Trail Conference and bring order to the system of trails and blazes. It has functioned ever since, building and maintaining trails, facilitating communication between the area’s numerous walking clubs, and working to preserve the region’s wild lands from development. Vincent Schaefer, of the Mohawk Valley Hiking Club, originated the idea for the Long Path during the New York region’s walking renaissance of the 1920s. Despite extensive preliminary planning, the idea eventually languished. It lay dormant until the 1960s, when local walkers Robert Jensen and Michael Warren Revived the dream and began actively promoting the concept. By 1987, the trail was completed all the way to East Windham, N.Y., in the Catskills, and it has been extended a short way further. Proponents hope to extend it to the Adirondacks. Much of the Long Path followed on this walk parallels the crest of the towering Palisade cliffs south of Piermont through Tallman State Park. Probably the first white men to come to this area were Henry Hudson and his crew, who may have anchored the Half Moon in present-day Piermont at the mouth of a creek then called the Tappan Slote, now named the Sparkill. Early Dutch settlers founded a settlement in the early 1600s near here, but they didn’t remain for long. The Native Americans from whom they had bought the land grew fed up with white man’s presence and destroyed the settlement in a regional uprising. Another small settlement was established in the 1600s along the Tappan Slote. Here, a small boat could go inland several miles before hitting a waterfall, just far enough to transport produce from inland farms back to the river for shipment to New York City. During this early period, a black settler named Nicholas Emmanuel established a farm and gave rise to a long line of farmers and business people whose descendants survive to this day in and around the community. By the Revolutionary War, an active community sprang up alongside the creek, where a gristmill and other small enterprises prospered. During the Revolution, the local population was divided in loyalty, and frequent attacks by the British, Tories, or Americans against local farms and businesses brought a virtual halt to the growth and prosperity. The small community had one of its finest hours in May 1783 when General George Washington and Sir Guy Carleton, commander-in-chief of the British forces, met here briefly before proceeding inland to Tappan, where the British formally surrendered. Old maps suggest that much of the land covered by this walk was farmed during the colonial period and in the 19th Century. Thankfully, the farm land of the Dutch settlers gave way to forest in the 19th Century when farming shifted to less populated areas. It could have turned out quite differently. In 1832, Jeremiah Pierson and his son-in-law, Eleazor Lord, who lived in what is now Piermont, incorporated the New York and Erie Railroad and decided to establish the eastern terminal at the Piermont site. They believed that the hills directly across from New York City could not be cost-effectively bored for a tunnel and that the Sparkill Creek afforded good access to the interior. Lord had an estate on a hill above the village and had grand schemes to develop the region with housing and local industry. For the idea to work, the railroad had to provide easy access to docks along the river, so that passengers and freight could be easily transferred onto boats for the final journey into New York. The name Piermont did not originate until after the construction of a huge pier, which sticks far out into the river. Lord apparently devised the name by linking the word pier to “mont,” referring to the hill that rises above the town. With the construction of the huge pier and railroad came hundreds of workers who crowded the small village and erected shanty towns for shelter. The town reached the peak of its glory in 1851, when the train line to Lake Erie was complete, and such dignitaries as President Millard Fillmore, Secretary of State Daniel Webster, and hundreds of other big shots disembarked in the town with great fanfare to begin the inaugural rail journey to Lake Erie. The Piermont terminal enjoyed only a brief period of success. A rival railroad developer built a tunnel further south and opened a terminal directly across from Manhattan. The Piermont line almost immediately lost business but remained active for several years. In 1860, the town’s population had reached nearly 2,500. Within a few more years, nearly half the people had left, and Piermont’s days of industrial glory had passed forever. Today, Piermont maintains much of its quaint 19th-Century appearance, undisturbed by industry. The downtown received a small facelift when the movie director Woody Allen made his movie, The Purple Rose of Cairo, and celebrities who live in the nearby exclusive enclave of Sneden’s Landing sometimes can be seen frequenting the small village’s restaurants and nightspots.